I’m about to share the secrets of how I work. My job takes place almost entirely in the digital world: Facebook, Twitter, YouTube, blogs, web sites, email, online news and trade publications, webinars, online meetings, phone conferences. I am in virtual Mumbai one moment and Marshall, Missouri, the next. It’s rare for me to physically see many of the people I work directly with – people in offices in Buenos Aires, Sao Paulo, Mexico City, Brussels, London, Washington, Calgary. It’s fast-paced work, often hectic, sometimes resembling the frenzy of Wall Street or the Chicago Board of Trade. Most times it’s straightforward work, with a rhythm and pace to it like most other work. A few times, it’s like wading through a swamp, dealing with the dark side of the human condition; people will say anything, reveal anything, and sometimes threaten anything that they would never dream of doing face-to-face. This is when I turn to poetry, in three different ways. First, I’ll read poetry – take a few minutes and read several poems, or simply reread one poem several times. The reading hollows out a space of quiet and solitude in the middle of online crises, ringing phones, urgent emails, and endless meetings. reveling in the offered solace. Second, because I do a lot of online writing, I’ll turn my back on the computer, mute the phone, and work on writing assignments – using poetic form. A blog post about a customer begins as a poem. A news summary starts its life in rhyming couplets. A tweet for the company begins as a 140-character poem (perhaps learning from the origin of Tweetspeak Poetry). An email, one that deals with a particularly difficult problem, begins as a poem, each line focused on different aspects of the issue. Here, poetry is clarifying, allowing me to reduce all the extraneous and ancillary thoughts to a few, simple statements. It allows me to explain what it is I’m actually writing about. Third, because I work across channels, with information flowing in and out and across on a constant basis, work can easily slip towards chaos and confusion. We playfully call this “exploding head syndrome, ” but there’s a serious side to it – you forget what channel is being worked, mistakes can be made, and the mind has a tendency to shut down. The work requires speed – speed and accuracy. Here, poetry is organizing. I flip a switch in my head and start thinking poetry, processing information like processing a poem, understanding the way the thoughts are flowing and how the words are used. After I became used to doing this, I began to “see” the poetry in the flow of communication around me and my team. The rhyme and reason are there, and thinking of it as poetry allows me to find it, identify it, then shape it into the work that needs to be done. That’s how I use poetry at work – to restore, to clarify, to organize. I’m wondering how I could function without it. Photograph by John Tann. Sourced via Flickr. Poetry at Work™ post by Glynn Young, author of the novels Dancing Priest and the recently published A Light Shining. Buy a year of happy work mornings today, just $5.99 — Read a poem a day, become a better poet. In March we’re exploring the theme The Pantoum. 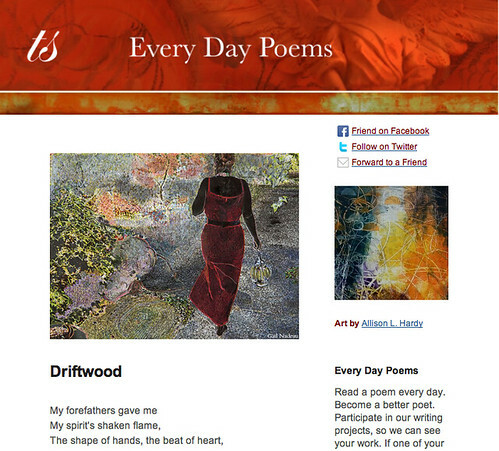 Now you can easily follow our new Poetry at Work posts. 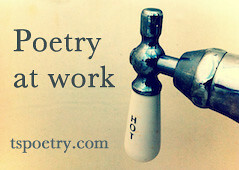 Add one of our Poetry at Work badges to your blog or website today! It would be cool to imagine an entire company taking up your method. I’m with Maureen. There’s something to it. Love this! My job is nothing like yours, but I do break for extra poetry when it gets stressful. Hi love the poems and tie into your work life. Great article.I agree with Maureen. I’d love to see an entire company using this method.Better yet, I’d love to work for a company that does this. Using poetry this way seems to add depth and dimension the poetry and the work.